Many households have water-softening units fitted to reduce household limescale on appliances and to reduce the quantity of household detergents used. Advice can be confusing on whether softened water is safe for plant use. Can I used softened water on plants? Calcium and magnesium are the minerals in water that are mainly responsible for its hardness. The most popular water-softening units exchange the calcium and magnesium ions for sodium ions. This leaves a trace of sodium in the water. Consequently it is recommended that the outside tap runs off the mains rather than through the water-softening unit. Rain water is always the first choice; it is free from hard water elements and is the correct pH for the majority of plants, including acid-lovers such as rhododendrons and camellias. The only down side is the limitations in the storage of rain water and that it usually runs out when it is most needed in the middle of summer. Stored rain water is not recommended for use with seeds and seedlings in case it carries disease. Tap water will meet the needs of most garden plants but is relatively costly and is a finite resource and should be used carefully. Watering only when needed and soil level is most economical method. Ericaceous plants (acid-loving) are fine to be watered with tap water when rain water supplies have run out. However, over a long period ericaceous plants watered with hard water will start showing signs of chlorosis (yellowing of the leaves). 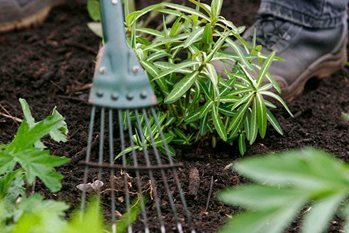 Mulching with lime-free organic mulches such as composted pine needles or composted bark will help retain moisture within the soil and keep the pH low. Ideally keep the usage of tap water to a short spell over the summer months. Purified water is available in a number of forms; including distilled and deionised. These waters do not contain any impurities such as minerals. Purified water is too expensive for widescale use but can be useful for plants that do best with rain water, such as orchis, when rain water is unavailable. However, because they lack minerals, balanced fertilizers need to be added to meet plant needs. Although orchid specialists might have their own deioniser or reverse osmosis machines, most people have to source purified water from a car accessory shop or an aquatic shop. Cost, transportation and storage limitations usually make them impractical for all but a few plants. Note: Water collected from tumble dryers and dehumidifiers is distilled and therefore suitable for use on plants. Boiled water from the kettle can be used when cooled for plants. In hard water areas some of the calcium will be removed during the boiling process. Obviously this is an expensive way to water your ericaceous plants but may be worth considering as a stop-gap for watering a small number of containers when rain water is not available.